The Te Arawa people of the Bay of Plenty are the offspring of Pūhaorangi, a celestial being who descended with the beautiful maiden Te Kuraimonoa, begat the revered ancestor Ohomairangi. Ohomairangi lived in the Polynesian homeland known as Hawaiki. 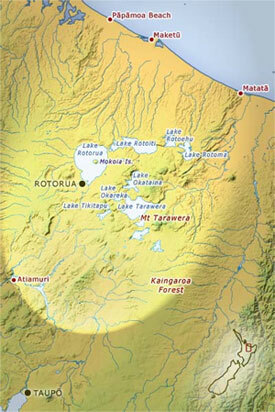 His people became known as Ngāti Ohomairangi and lived in the village of Maketū. His son, Atuamatua had six sons, Tia, Hei, Rakauri, Houmaitawhiti, Oro and Makaa, who became the leading family group of Ngāti Ohomairangi. The migration to Te Ika-a-Māui (New Zealand’s North Island) over 20 generations ago was instigated by war over scarcity of resources and land. Houmaitawhiti, one of Atuamatua’s six sons, had a son, Tamatekapua. Tamatekapua took up the challenge laid down by his father: to seek a peaceful new home in the southern islands of New Zealand. Over 30 Ngāti Ohomairangi tribe members accompanied Tamatekapua and the tohunga, Ngatoroirangi, in the double-hulled canoe originally named Ngā rākau rua a Atuamatua (the two trunks of Atuamatua) in memory of their father. During the voyage they had a perilous encounter with the great ocean creature, Te Parata, who almost swallowed them. However, one story goes that they were delivered from the jaws of certain death by a mythical great shark, and the people renamed the canoe and themselves Te Arawa in its honour. On entering the Kaituna estuary beside Ōkūrei, the bow of the Te Arawa canoe was tethered to a large rock, Tokaparore, and to an anchor rock called Tūterangiharuru, which held her fast in the current of the Kaituna River. The tohunga Ngātoroirangi was the first to step off, conducting rituals beneath a pōhutukawa tree in full bloom. Today this site is remembered as Ōngātoro, and commemorated by a monument built in 1940. A pā established on the Ōkūrei headland close to the moored canoe was named Maketū, after their home village on Rangiātea, in Hawaiki. Ko Te Arawa māngai-nui ūpoko tū-takitaki. Te Arawa the determined people.